After not playing a single Napoleonics game last year, it was finally time to have one again. 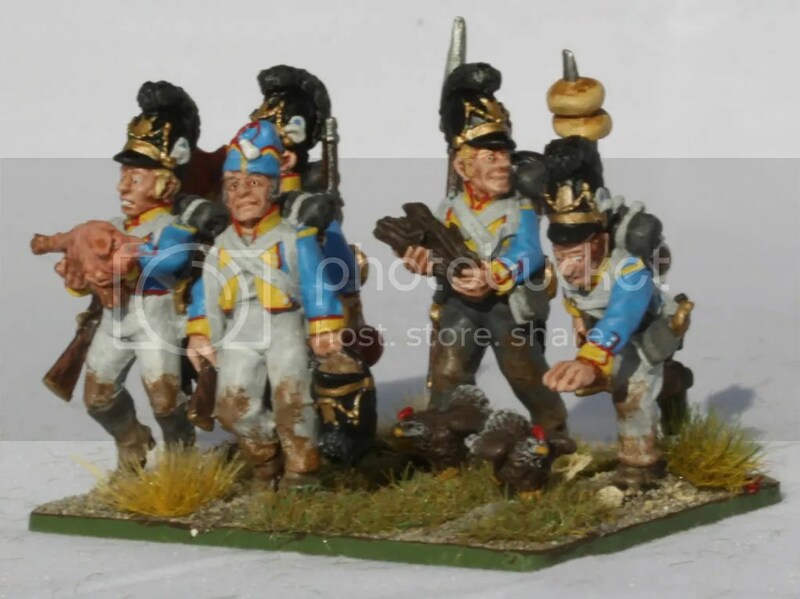 And this time not only in 15mm, but with all the 28mms I have painted lately we could play in 28mm. We had to improvise a little bit though. The Allies consisted of three brigades. One Prussian cavalry brigade (Leibhusaren, Brandenburg Uhlanen, Schlesische Landwehr Kavallerie), one mixed infantry Brigade (42nd Highland, Bayrisches Infanterieregiment Sachsen-Hildburghausen, 2te Ostpreußische Fuisiliere and 13te Schlesische Landwehr), a Prussian Infantry Brigade (Gardejäger/Ostpreußische Jäger, 12te Reserveinfanterie, 14te and 15te Schlesische Landwehr) and an independent 6pdr battery. The majority of officers were British. The French did not have these kinds of problems and could bring up their numbers on their own. 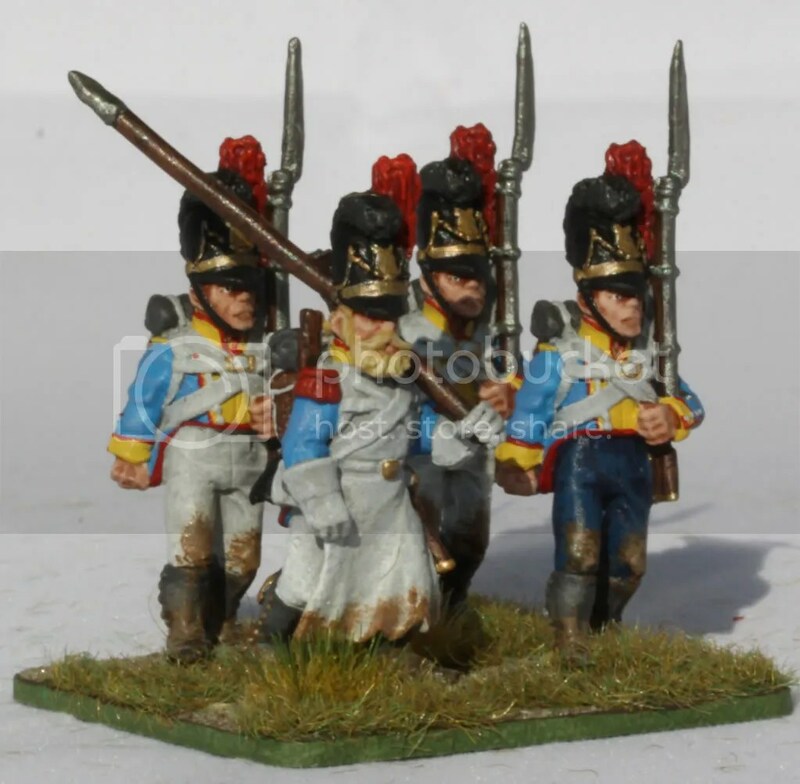 There was one infantry brigade consisting of 3 units of line and one of Légère, another one consisting of three battalions of Marine Artillery (fighting as infantry), the Regiment Joseph Napoleon and another unit of Légère. They also had a unit of Cuirassiers and two batteries of artillery (one consisting of 6pdrs and one of 12pdrs). Deployment was straightforward for both sides. 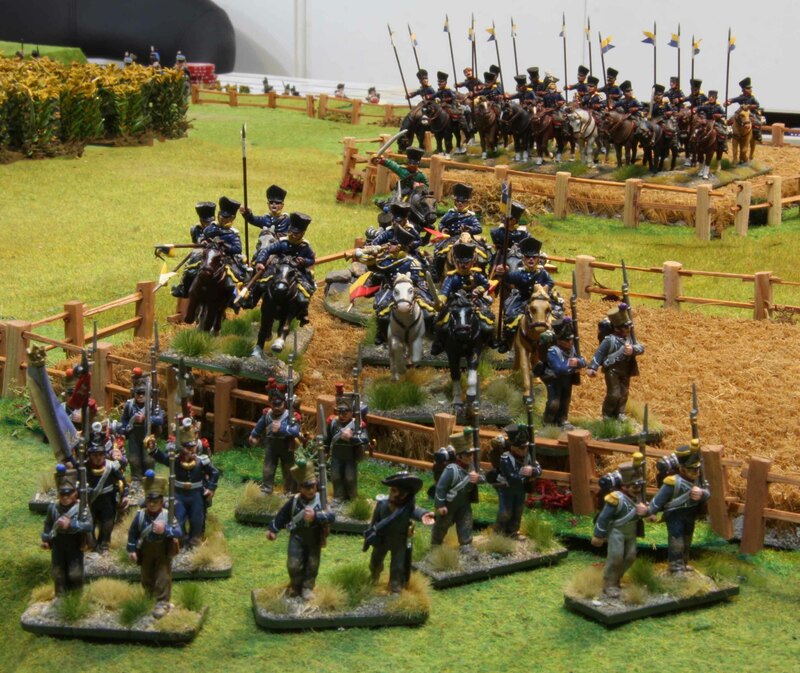 I (playing the Prussians) deployed from left to right my artillery, followed by the cavalry, mixed infantry Brigade and the Prussian Brigade. All started with advance orders and deployed mostly in line of column of attack formations. 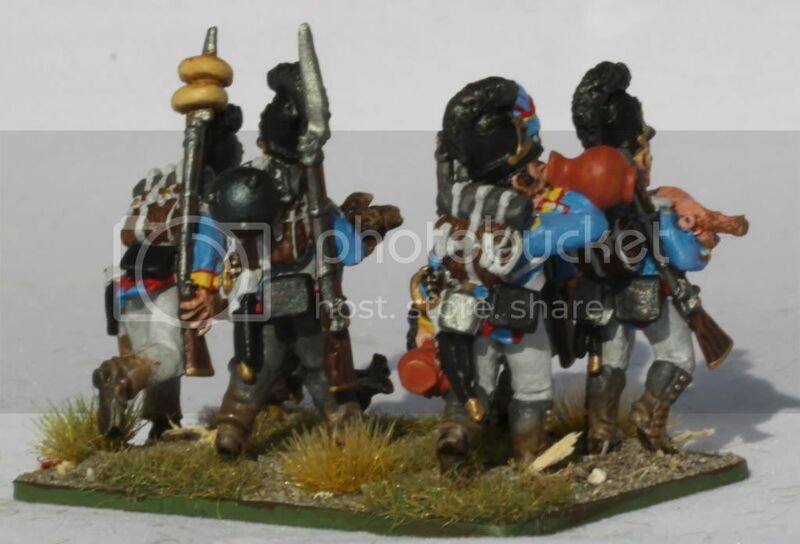 The leading battalions deployed skirmishers, the Jäger battalion in full skirmish deployment. The French (played by Dirk) deployed left to right (seen from the Prussian side) their Marines Brigade with the Cuirassiers behind them, the limbered up 6pdrs, delpoyed 12pdr and last the remaining Brigade. They were on move orders, mostly deployed in attack columns as well, but had not skirmishers deployed. The terrain was also quiet open with a few fields and valleys and that was about it. 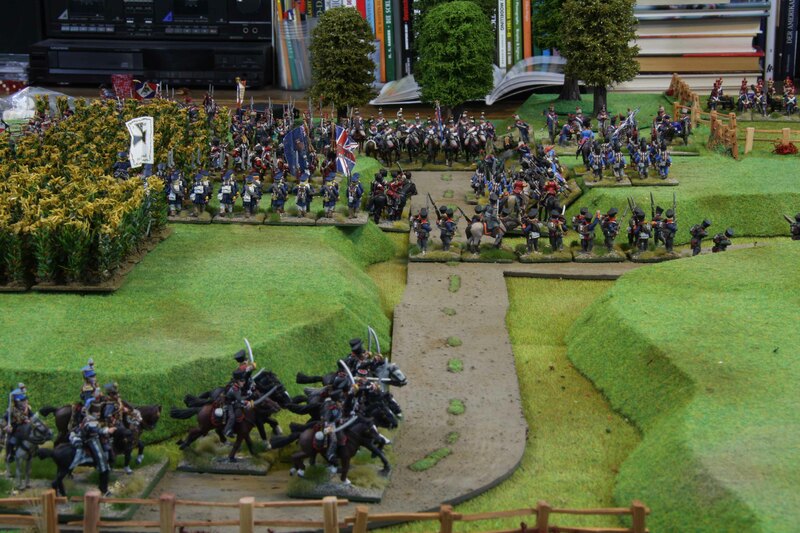 The French activated first and only advanced towards the Prussian lines, with the Cuirassiers staying behind. The 12pdrs opened up on the Bavarians and caused them some casualties and that was about it. 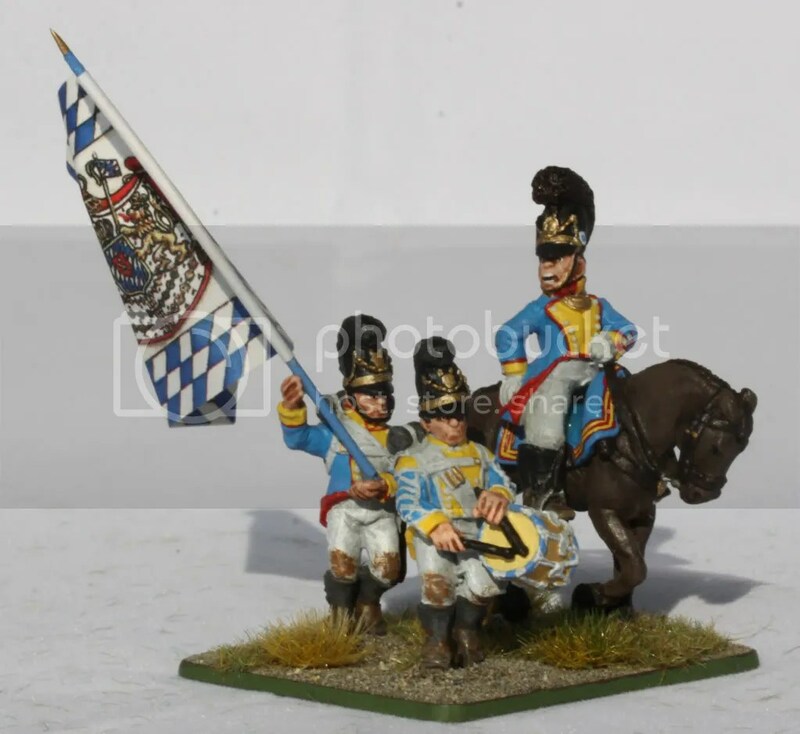 Now the Prussians activated. Both the infantry Brigades advanced with the Schützen pouring some fire into the opposing French infantry causing them minor casualties. 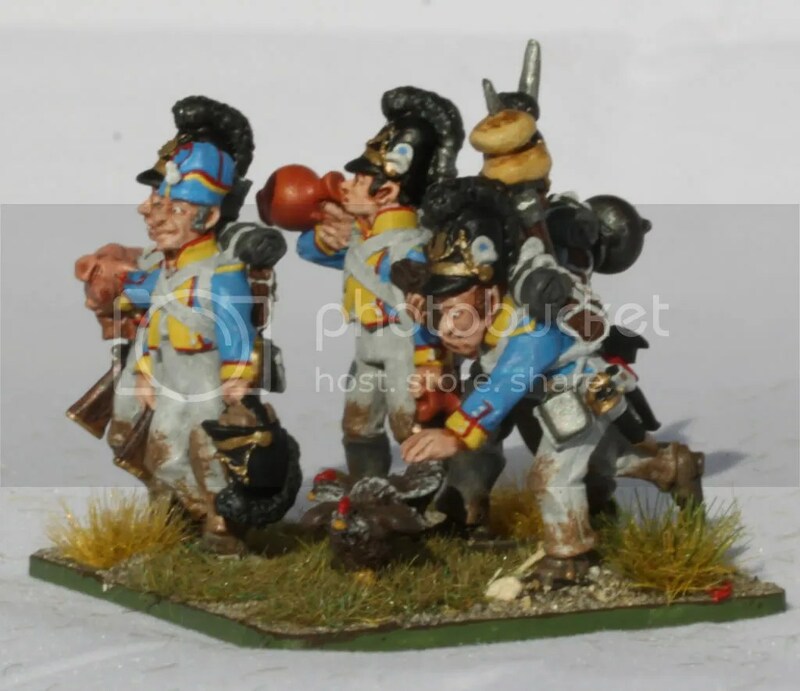 The Prussian artillery fired on the Regiment Joseph Napoleon causing them the first casualties. This would actually be their last fire since future events and their position at the far end of the line would leave them without targets. The cavalry activated, with the CnC attaching himself to the Leibhussaren to lead them to the right flank. I had managed to roll quiet good when it came to command points for that round. Therefore the cavalry received new orders putting them to attack and still perform according to that order. The Brandenburg Uhlanen decided to charge the Marine Artillery battalion straight ahead. Not having time to change to square they only managed to pull off a defensive volley, which could not deter the Uhlans. They smashed into the infantry and using their lances virtually cut them to pieces. 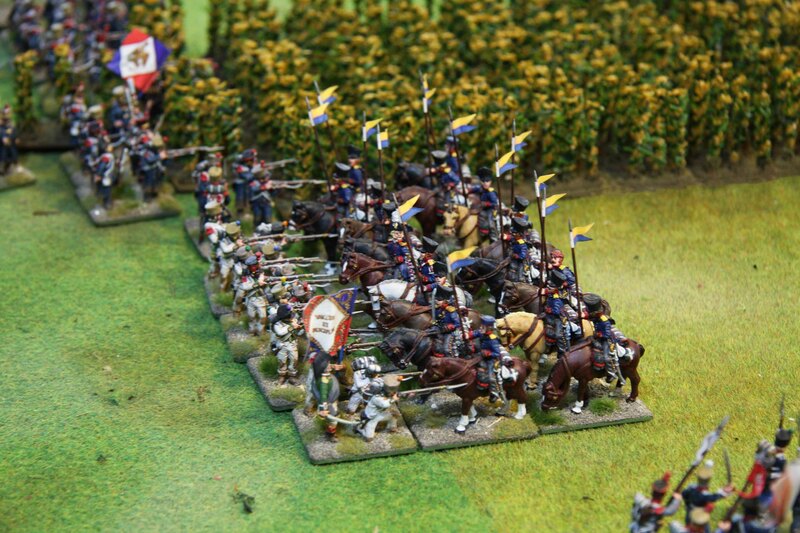 Far less than a quarter of their number remained and were run down by the Uhlans… they were out of the game. Their destruction also shook the morale of the Légère next to them. Now the Landwehr cavalry decided to try the same with the Légère bringing up the French flank. But their mettle failed them and they did not even initiate the charge. Now the initiative passed back to the French (we failed to roll initiative for the first two rounds). 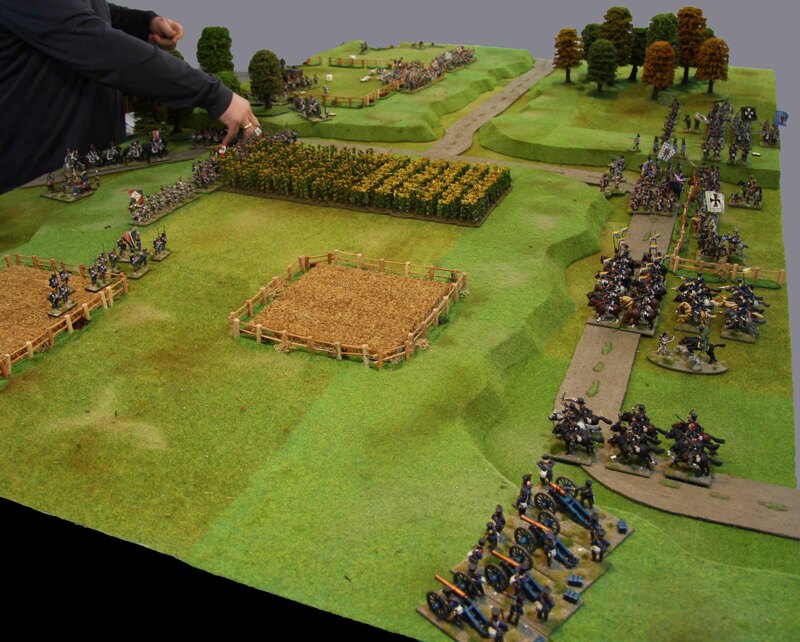 The next Marine battalion moved into the flank of the Uhlans and poured musket fire into them. This was enough to make them lose their nerve and they retreated backwards. The 6pdrs having moved forward unlimbered and fired at the Black Watch causing them some casualties. The 12 pdrs kept their fire on the Bavarians causing them yet more losses. Both units kept their nerve. The Cuirassiers reformed from column of march to column of squadrons to attack the allied infantry, but they too did not even initiate their charge. Now Prussians were to act again. And I rolled exceptionally good when it came to command points. The mixed national brigade was therefore able to change their order to attack and even advanced further towards the enemy. The Highlanders and Bavarians recalled their skirmishers and the Bavarians even attempted to charge the battery of 6 pdrs. But they too could not sum up the nerve due to the losses already incurred. The other infantry brigade only managed to change their orders to attack as well. The Jäger caused further losses on the French opposing them, while the rest of their Brigade moved to link up with them. All these exploitation moves by the infantry had eaten up virtually all the points. Therefore the cavalry could only act upon their Brigade order. 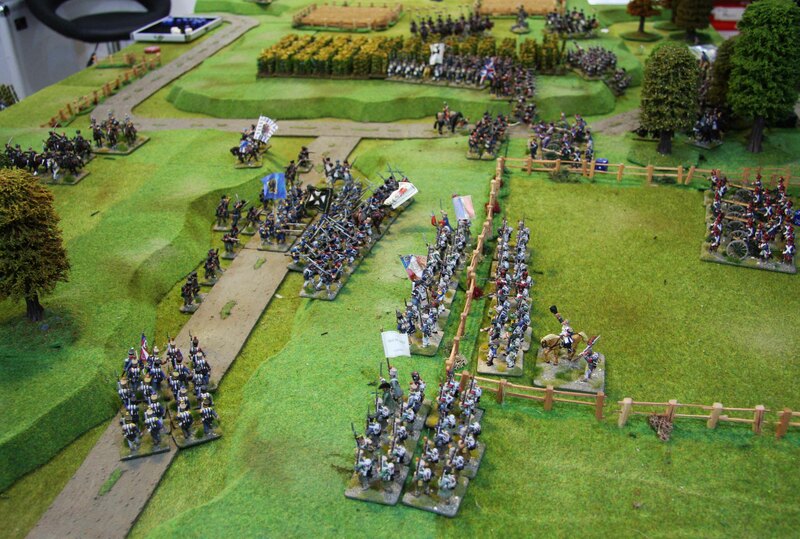 The Hussars moved further to the right flank accompanied be the CnC, the Uhlans reformed inside a wheat field. The Landwehr cavalry again tried to charge the Légère. This time they were able to initiate the charge and caught the Légère by surprise. They tried to run but the Landwehr caught up with them and trampled them down, spelling their end. The French were quiet afraid of the infantry to their front and both French artillery batteries poured their fire into the Bavarians. Although starting as the largest battalion on the Allied side, this virtually annihilated them. The few men left had enough and fled the field. The Marines that had already fired at the Uhlans the previous turn turned around and together with their sister battalion fired at the 42nd Highland. The losses were average and the Scotsmen stood their ground. Otherwise their was just some more maneuvering on the French part and that was it. Now the Allies had to fight back. 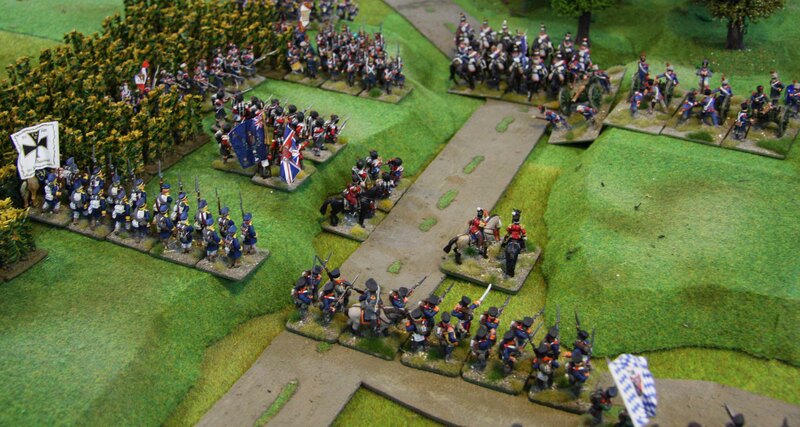 While the Uhlans and Landwehr cavalry only brought themselves into position for a charge next round, the Hussars had reached the other flank and attempted to charge the French infantry on that flank, but as seemed the norm… failed to initiate the charge. The right hand infantry brigade advanced and passed through the screen formed by the Jäger. The lead battalion poured some fire into the French for some further losses. But the main event was in the center. The Black Watch charged the Marine Artillery to their front, they only suffered light losses, but caused them severe losses. The French Marines broke and fled. Seeing this the Cuirassiers also felt threatened and withdrew to the near woods. The 12te Schlesische Landwehr attempted to charge the Marines in the flank of the British infantry, but were halted by the defensive fire. Now the only thing that remained was the attack on the French 6pdrs. The fusiliers had to take this job. But the French would not allow that without resistance. The artillery fired canister rounds into them causing them severe losses. But still the Prussians came on. In the ensuing close combat more than half the artillery crew were killed, wounded or taken prisoner. the rest left their guns and fled. This was it… one battery out of action and one infantry battalion had lost so many units that it had become ineffective and the Cuirassiers would have to reform as well. The French called it a day. In the end this was a good game spread out over two sessions. We refreshed our rule knowledge and learned a few new things. What we will definitely have to change was the table size. We did played on a 1,5m deep and 2,5, wide table. We failed to realize the for 28mm this was not deep enough, as we started the game with the Prussians being well into range for the 12pdrs and the French already being threatened by the cavalry. Otherwise it was good fun.